Is it really the airtime that's too extreme, or is it the restraints. I'm thinking it's the restraints since to me, it's impossible for a ride to have too much airtime. My friend described the air on Skyrush, or Thighcrush as he called it, to have sustained air such as that on El Toro's first drop, but that it had no single moment of insane airtime as strong as the rolling thunder. I think that it's the restraints, but some of the lateral Gs also made the ride very uncomfortable for me. 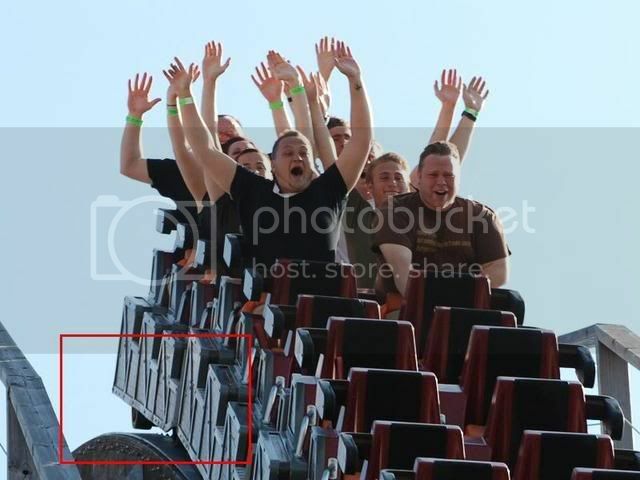 There were a few turns on the ride where my torso stayed in one position and the seatback was flung to the side. Couple that with the restraint pressing down hard on just one area of my legs, and then the ridiculous breakdown at the end of the ride, in which I had to endure 20 minutes of pain, and Skyrush is probably the second worst roller coaster experience I have ever had. It was second only to Son of Beast in it's first season. Also, it takes so much away from Comet's beauty, in my opinion. Oh, but this is about the air on Skyrush? The first drop was pretty fun. I can't recall any fun after that. With I-305 and Skyrush, we now have rides that are super high intensity but low fun. You know, kinda like RCT rates coasters in 3 categories: Excitment/Intensity/Nausea. Of course, all that snapping back and forth is very popular with some; those 2 rides clearly have their fans. Voyage pushes people almost to that point, but there is so much fun involved the intensity is just enough. It's a fun intensity. Superman at Six Flags New England was great when I last rode it in 2006, haven't been back since they added high-back with speakers. It was a nice combo of Millenium Force friendliness with a little intensity thrown in, and has a great setting cover by "stuff" and tunnels. Is it really the airtime that's too extreme, or is it the restraints. I'm thinking it's the restraints since to me, it's impossible for a ride to have too much airtime. Super high forces in the upward direction require super tight restraints; there has to be less of a possibility of *anything* going wrong at those speeds and accelerations. I hate it, personally. At that point, it's not air time anymore it's "uplift forces." It does have it's die-hard fans. ^^ there is no part of Skyrush that made me feel like that Travis. I've ridden over 20 times. Its the restraints. If you hold onto the sidebars of the restraints its not near as uncomfortable. You shouldn't have to ride defensively like that, but the airtime is that intense. I had no problem with the change in direction. Very smooth ride in my opinion. Travis is also a 15 ft tall supermodel. That could have been the reason. I'm only 5'9 and I had no thigh pain whatsoever. edit: FWIW, I would love to try StormRunner, Fahrenheit, and most of all Maverick....with those trains (obviously shorter versions, LOL). What's the single best moment on any coaster in the world? This monster of a hill, that's what. When I rode Skyrush, I felt like I had a first-hand experience of some of the mechanics involved for those who have been ejected from Intamin rides. The restraint came down on the thigh, and not anywhere on my waist. As a result, the airtime gave a very unsettling feeling of rotating forward out of the seat. The angle of the restraint felt bizarre; it does not come down flush on the thigh but strikes the thigh at an angle. This creates the "noodle" effect many have talked about: only the corner of the restraint rested on me. Again, because my midsection was not at all restrained, my entire lower half came right out of the seat and gave the sensation of wanting to rotate forward over the restraint during moments of airtime (the first airtime hill being the worst). Of course, the sheer downward force of the restraint on the thigh meant that my legs could not start rotating as well and so I was not going anywhere. Unfortunately, this creates an unpleasant ride experience not only due to the thigh pain, but also due to the terror of so much motion of my torso and upper body. Perhaps I am over-dramatizing, but something just felt off about it all. An I-305 type soft-strap would do the trick of stopping any of that forward motion...or if the angle was adjusted on the lap bar it would probably come down farther on your person, thus hitting the thighs a little more flush and hopefully getting closer to restraining your midsection. This is far different from El Toro, where the airtime is just as aggressive, but you never have the sensation of that forward rotation over the restraint. On El Toro you are a little more "in" the train rather than riding on top of it. Also, the seat belt does wonders because it restrains your torso fairly well (since it comes across your lap) and not just your thighs. Further, the airtime seems to pop you "up" aggressively, but not forwards. While the airtime is just as insane, the sensation is quite different. And of course the situation on B&M hypers is different because we are not dealing with the same type of airtime. However, I wonder if the slight recline of the seats on B&M hypers works against that forward motion of the body in airtime. On the B&M's I always feel like I pop up and down out of my seat, but never to the side or forwards. Due to the design of the sides of the seat, the lap bar creates a seal around the whole seat which seriously limits any ways to come out of the seat. Please correct me where I am off. Rhode Island is neither a road nor an island, discuss. It is definitely the restraints on Skyrush. I didn't find the laterals too intense with mild defensive riding, but those restraints are in definite need of a re-do. Rumor has it that axle problems and the restraint problems are making it necessary for new trains. We'll see what happens because if Intamin can fix the issue, Skyrush will kick major tail.